We wish to state that any personal data collected to process your order and the after-sales assistance, for instance personal information such as name and surname, residence and number and expiry date of the Credit Card, holder of the credit card and related security code) will be processed by Celtic Tweeds with sole shareholder, with registered offices in 6 Balbriggan Retail Park, Dublin Road, Balbriggan, K32 K002 Dublin, Ireland, tax code and VAT n.3385075 and Celtic Tweeds with sole shareholder, with registered offices in 6 Balbriggan Retail Park, Dublin Road, Balbriggan, K32 K002, Dublin (D), VAT n.3385075. 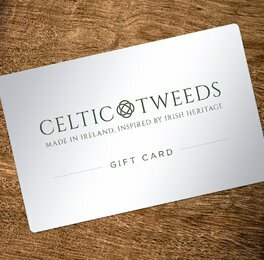 Celtic Tweeds is in charge of direct sales to users and of the transactions carried out in Celtic Tweeds's online shop, such as fulfilling customer orders, sale and delivery of products, managing returns and warranties and any other activity necessary to the sale of products through Celtic Tweeds's online shop. In case of refusal to provide your data, Celtic Tweeds would not be able to accept any order from you. Should you wish to have the complete list of the data controllers that process your data for Celtic Tweeds and Celtic Tweeds, you can contact our Customer Service or write to Celtic Tweeds or Celtic Tweeds to the addresses provided above. Celtic Tweeds and Celtic Tweeds are joint data controllers with regards to the processing of personal information (also handled by means of automated instruments) for marketing, informative and promotional purposes, included those of commercial nature, among which the newsletter, market research and statistics. For the purposes mentioned above, and within the limits of your consent, Celtic Tweeds and Celtic Tweeds may collect your personal data, name, surname, gender, address, birth date, email and country of residence. Data acquired will be processed manually and electronically and will be used exclusively for the purposes authorized by the user's consent. We also inform you that your personal data will not be communicated to third parties or otherwise distributed, with the exception of companies that are controlling, subsidiaries and/or affiliated to Celtic Tweeds and Celtic Tweeds and are involved in marketing or commercial activities on behalf of Celtic Tweeds. You can contact Celtic Tweeds and Celtic Tweeds if you wish to be informed on your personal data, to update, modify or erase your data if processed unlawfully, or if you wish to exercise any right pursuant to article 7 of the Legislative Decree 196/2003, with regards to the data collected relating to the order processing and the post-sale assistance. You can contact Celtic Tweeds and Celtic Tweeds if you wish to be informed on your personal data, to update, modify or erase your data, or if you wish to exercise any right pursuant to article 7 of the Legislative Decree 196/2003, with regards to the Newsletter, promotional, informational and advertising materials which may have been authorized. If you wish to exercise your rights pursuant to the Italian Data Protection Code, you can address a request to Celtic Tweeds or Celtic Tweeds to the addresses provided above. You can also request a complete and updated list of the data controllers at the same addresses. I confirm my acceptance to the processing of my personal information for marketing and informative and promotional purposes, included of commercial nature, among which your newsletter, exclusively by Celtic Tweeds and Celtic Tweeds. I confirm my acceptance to the processing of my personal information, anonymous, for market research, statistics exclusively by Celtic Tweeds and Celtic Tweeds.